On Friday 3 December, Howard Trillo led a small party of 4 on this adventurous walk. Following an early start at 8am, the group head off on this long and demanding climb. The ridge began at ground level close to the sealed road so no 4WD access was necessary. The climb along the ridge was quite exciting as in parts the route narrowed to one shoe-width with long steep descents on either or both sides. However being up high guaranteed fantastic views enhanced by the clear winter skies. The ridge undulated for over 2 hours until the false peak was reached. This was quite dramatic as a scramble up the rocks to a defined pointed peak was required. But the true summit was still an hour or so along at the end of the ridge line. This grade of this section was easier but by having to going down onto the flank of the summit extra uphill walking was encountered. After a lunch stop to admire the views, we headed down a relatively gentle slope onto the plateau area. Aiming for the far right hand edge, we crossed a number of steep walled canyons before hitting a well worn path that skirted the edge of the cliffs that line the plateau. Entering our final gorge for the day we followed this down for over an hour. Multiple dried up waterfalls were encountered requiring some scrambling to get through. Once back on the flat gravel plane it was another 45 minute stroll back to the car. Jebel al Qattar offered fantastic scenery and a challenging walk and scramble among the cliffs and gorges. Although tired at the end, I think we all enjoyed this majestic walk in the Oman mountains. 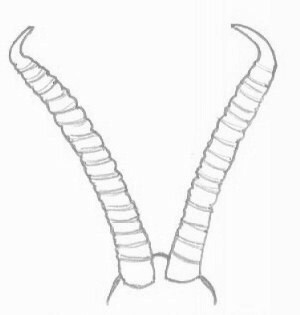 Horns are of medium length for males, with a mean length of 236mm while short for females, with a medium length of 96mm. 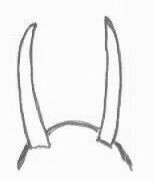 The horns are set wide apart at their bases, bowed outward with tips slightly in-turned. Male horns are notably ridged while those of females are smooth. The pelage colour is reddish brown with a well defined dark flank stripe and white abdomen. This species is nowhere common in the UAE and is usually seen in small parties or lone individuals. They are most often observed "in the wild" in the Jebel Ali-Sweihan-Abu Dhabi triangle, as well as on the Oman/UAE border between Ayn al Faida and Umm az Zumul. Other sightings throughout the mountainous regions are infrequent. 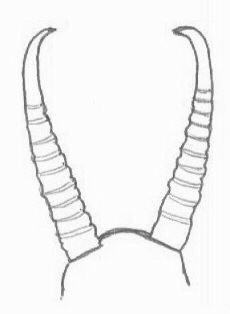 Horns of adult males are long, with a mean length of 268mm while females are often hornless or with variably developed horns. The horns are set close together at their bases and widely divergent at the tips. Male horns are also heavily ridged. The pelage colour is variable although usually lighter in colour than for the Mountain Gazelle. The face is whitish and the flank stripe is ill defined. Males have a goiter-like throat swelling in the breeding season and the general built is thick-set. This species is even less common in the UAE than the Mountain Gazelle and are usually limited to the sandy western regions bordering Saudi Arabia. Unmistakable, big lizard (up to 60 cm), similar in size to the Desert Monitor (Varanus griseus), but distinguished from the latter by its thick, spiny tail (Desert Monitor has a whip-like tail). This herbivorous (eats vegetation) burrowing lizard lives in loose colonies on hard substrate usually found on inter-dune flats. This agamid is associated with mountainous terrain and is easily identified by the males' blue head during the mating season. This nocturnal gecko is most commonly seen around houses in the UAE. The feet of this gecko is unmistakable and they are frequently observed in caves and abandoned houses. This gecko and above mentioned can be seen at Abool Fort close to Al Ain. These small diurnal geckos are common in mountainous terrain throughout the Hajar mountains. These lizards are diurnal and although there are five species, it is difficult to distinguish between them in the field. The genus Lacerta and Messalin are also very similar thus compounding the problem of identification. The Sandfish is the best known of the five skinks found in the UAE. It is a smooth scaled diurnal lizard often diving into sand to escape predators and also for thermo-regulation. It is often used as a source of food by desert dwelling tribes. Milk was processed in a number of ways to create products with desirable characteristics such as texture, taste and storage properties. The processing methods used in the UAE were ideally suited to the resources of small tribal units using basic equipment. 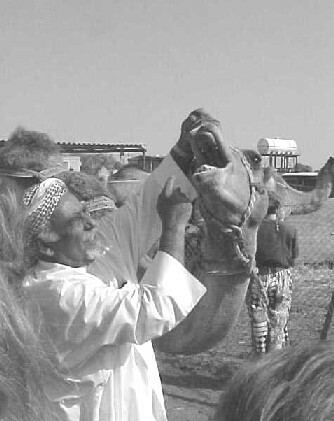 Fresh camel’s milk was considered to be already ‘cooked’ if it was still at the temperature of the camel’s udder. The simplest processing was to heat the milk, a desirable objective in the mountains where temperatures can approach freezing point in the winter. An ingenious method was used in Oman. Selected round stones were heated in the fire and dropped directly into the milking bowl. This method has been in recorded use since Roman times and is economical and requires no specialised implements. Hot milk was spiced with ginger, cardamom, fenugreek seed or saffron. Milk was kept in animal skin bags, usually goatskins, for short term storage. In the typical summer temperatures of 30 to 48 degrees Centigrade, initial fermentation or conversion to laban, a yoghurt type product, was ensured by the build up of residues from previous batches with attendant bacteria. Storage bags were carefully selected and maintained to guarantee this process. There was no way to sterilise these storage bags. The laban was consumed fresh and also made into three further products; labneh a strained and thickened product; chami a cooked and reduced soft cheese; and dihn or zibda, fresh butter. All these products had a limited storage life. Chami was a favourite breakfast dish and zibda was eaten with flat bread and the excellent local honey. Zibda was made by churning the laban in a goatskin, sigga, which was hung by a wooden tripod and rocked back and forth. Air was blown into the bag at regular intervals to ensure that it stayed inflated. The butter was collected and the liquid residue was either consumed as a drink, sharab, or may have been processed to a form of low-fat kami. Lizard skin bags were used to store zibda. Again these products could be processed further to avoid waste as they had limited storage capabilities. There are a few references to cheese, jibna. This was probably labneh or chami which had been strained to reduce the moisture content to promote slightly longer storage. Zibda was converted to samn, clarified butter. This was a very important product as it could be stored for long periods and thus was an article of barter or commerce. It is still available in the traditional markets, usually sold in re-cycled Vimto bottles. Goatskins were used in the past to store and transport samn. Kami was prepared from chami or labneh flattened and pressed into small thin cakes and dried in the sun. The end product varies from broken granules to solid cakes, all rock hard and with a long storage life. This was a useful store food which was eaten directly, crumbled into dishes or pounded with water to make a form of fat-free milk. Like samn this artisanal product is still available in the traditional markets. A large range of imported dairy products is available to the very cosmopolitan population of the UAE. Judging by the typical supermarket shelf, particularly popular products are butter and ghee, dried milk powder and a range of cheeses. Dried milk powder was an early introduction and was ideally suited to the very basic storage and transport conditions which prevailed until development. Ghee has effectively replaced samn. The selection of Middle Eastern cheeses is particularly good. Local factories are now producing cheeses matching those of foreign origin. Most Middle Eastern cheeses are soft and relatively fresh. This reflects the climatic conditions which are generally unsuitable for maturing cheese. They are often kept in brine, oil or whey as a means of preservation. They are eaten directly as breakfast and mezze food as well as being used in cooked dishes. Unsalted cheeses are used in sweets such as ataif, a Ramadan favourite made by deep frying pancakes stuffed with cheese or nuts. There are few matured cheeses, shankleesh and mish being the main examples and rumi and kashkawan are semi-matured. The pasta filata technique is used in the preparation of a number of these cheeses from northern Arabia such as majouleh, halloumi, and mushalal. The curd is kneaded in hot water, usually by hand producing a stringy or resilient texture and often a very characteristic shape. Many of the cheeses have to be rinsed or even soaked before consumption to reduce the salt and enable the generally mild flavour to be appreciated. The overwhelming use of dairy products is as primary food for direct consumption and this has always been the case. Studies in Gulf countries amongst national families show that there is a strong belief in the nutritional value of dairy food and also a strong sense of these being traditional foods. There has been an acceptance of imported products and modern packaging and some long established imports such as Nido brand milk powder have achieved icon status. The traditional culinary repertoire consisted of robust dishes making good use of a limited scope of resources. Dairy products had a role in these dishes; nearly half the recipes in a book of substantially traditional UAE recipes contain at least one dairy product. Additionally until the import of cooking oils became established in the 1970’s, the main cooking fat medium was samn which would have been used for the substantial part of the cuisine which involves frying. A frequent use for butter or samn is as a liquid garnish on savoury and sweet dishes. Colostrum was a valued product, a dessert, alelbah, was made from cow or goat colostrum in Bahrain. It was sweetened and spiced with cardamom and nigella seed. Coconut milk does not have a significant role in Emirati cuisine although the coconut palm is regularly planted in coastal areas. This is not the case in neighbouring Oman where the influence of a once extensive empire including the East African littoral is noticeable. Coconut milk is a favoured cooking medium for savoury dishes which are often well spiced and also appears in many sweet dishes. As noted above the use of samn as a cooking medium is declining due to the availability of cooking oils and also a perception of the health benefits associated with low cholesterol diet. The pattern of dairy consumption in the UAE has probably changed little from the prehistoric era of the Umm al Nar and Shimal settlements of the third millennium BC until the discovery of oil as a major natural resource in the 1960’s. People kept their own stock and had daily access to milk and straightforward techniques to prepare dairy produce. As a result dairy products formed a prime component of diet and an article of local commerce. Over the last three decades the availability of cold storage for importing, merchandising and home storage of products and the consolidation of dairy farming into large commercial units is having a long term effect on the consumption patterns of dairy products. The quantity and range of chilled dairy products in the local supermarkets and neighbourhood stores is broadening choice and making some traditional products obsolete. Samn has been replaced by ghee a similar product originating from the sub-continent. Imported dried milk powder has replaced kami as a storage product that can be reconstituted to a form of milk. At present the traditional products are still available in modest quantities in the local markets but the young generation who have had no exposure to these old products are unlikely to want, know how to use or be able to produce them in the future. This glossary details the dairy products currently available in the UAE, locally produced and imported together with some products that are in the process of being consigned to history. Items which originate outside the Middle East region such as icecream and dried milk powder have not been included. A table giving some details of nutritional composition is attached. Fresh white salted/unsalted cheese shaped by cloth wrapping into blocks of about 500 gm. with rounded corners, made from cow's milk and originating in the Lebanon. Production has spread to other countries and it is produced in several forms, salted hard versions for eating and minimum salt versions which melt readily for cooking. The low salt type is used for sweets, the salt being soaked out first. The cheese is firm with a slightly crumbly texture and a mild flavour. Cypriot cheese which is an import to the UAE markets. It is a medium fat soft cheese similar to halloumi. A soft white cheese shaped into short cylinders with striated sides originating from Egypt. Low fat versions are made from skimmed milk. Versions are also prepared from the whey and precipitated proteins derived from making other cheeses such as shankleesh or halloumi. The flavour is mild strengthening with time and it has a quite dense crumbly texture. Also seen as a prepacked block cheese. Eaten fresh and also mixed with chopped vegetables or pickles to make a dip. Another name for sharab laban, probably from north Arabia or Turkey. This cheese is shaped in soft round cakes 10 cm. in diameter, off-white in colour and with a creamy paste. It is unsalted and has a very mild taste. For eating fresh as it does not melt on cooking. Baladi means local. White cheese with a firm and dense paste, small voids well distributed, salty, strong mature flavour, possibly a sheep’s milk cheese, country of origin unknown. A Northern Emirates word for the sun-dried product of either laban or chami. White cheese with a dense smooth paste similar to feta, medium strength acidic flavour, now locally manufactured. Laban cooked to a thickened consistency like curds, used as a breakfast food with bread and also to accompany dried dates. A white cheese from Egypt packaged in cuboidal half kilo blocks, made from cow’s or buffalo milk. Salty, mild flavoured soft cheese with crevices in the dense paste. Unusually the salt is added before coagulation to control adverse bacteriological activity. Eaten fresh drizzled with olive oil and sliced cucumbers, tomatoes and flat bread. It can be matured under brine, darkening in colour and improving in flavour. This well-known cheese is popular and widely available in the middle east, loose as well as pre-packed. Another popular import from Cyprus, 1,000 tons are exported annually to Arab countries. A similar cheese, hellim, is made in the Lebanon and Syria. In Cyprus the cheeses were traditionally prepared from sheep and goat’s milk and after a minimum of 40 days in brine were considered to be ripe. Modern industrial production uses sheep’s, goat and cow’s milk and the cheeses are not ripened. The cheeses are produced by the pasta filata technique and are moulded into a flattish block with a pronounced central fold. Dried mint is sometimes included in this fold and the individual cheeses are vacuum packed with a little whey. The high protein content ensures that this cheese does not melt when cooked making it ideal for grilling or frying as a mezze dish. This cheese is a recent arrival in the supermarket cold cabinet. Fat content is stated to be 8%, presumably quoted as a solids ratio. The reduction in fat results in a chewier cheese but there is little effect on the taste compared to halloumi. A vacuum packed half kilo rectangular block of this traditional cheese from Syria. It proved to be a fresh white cheese packed in whey, quite dense texture, with a slightly acid taste and it was lightly seasoned with nigella seeds, habbat suda. It was an import from Izmir in Turkey. I have not seen this name used in Turkey and assume it is an export name. Another name for majouleh indicating an origin in Syria. The general word for cheese in Arabic often applied to local cheeses. Generic term for the soft white cheeses produced throughout the Arab world from a variety of milk for immediate consumption. In the Gulf countries sheep and goat’s milk were traditionally used and a crude form of rennet was prepared from the stomach of a suckling lamb. The UAE name for sun dried yoghourt. It costs 10 to 20 Dirhams a kilo depending on quality, some is in small flattened cakes 1-2 inches in diameter, some is in granular pieces of varying size. It is hard and has a slightly musty aroma vaguely reminiscent of cheese. Milk cooked with flour to form a thick cream for use in desserts. It is a north Arabian ingredient, used in restaurant desserts and not available commercially. A semi hard cheese in a flat disc shape about 20 cm. diameter and 500 gm. in weight, originating from Syria or Lebanon, pale straw colour with no rind, semi mature flavour improving with time in the fridge if not in a sealed container, rather stringy when cooked so best grated. A white cheese in the shape of a truncated cone with striations on the curved surface. Medium firm paste, a touch of salt and a mild flavour. Grills quite well and does not melt. Soured milk or yoghourt, an important element of the Arab diet. It used to be produced by storing milk overnight in a goatskin bag used regularly for the purpose by the Bedouin. It has a short storage life becoming more sharply flavoured with age. The word is used fairly loosely in the UAE to mean products with different consistencies. It can be like yoghourt as we are used to in the West with solid texture and it can also refer to a product of drinking consistency. Strained yoghourt formed into balls and dried enough to maintain their shape when stored in oil. They are served as a mezze dish with some of the storage oil drizzled over the top. Sold in jars in a number of variations made by rolling the balls in further flavourings, plain, with chilli pepper, mint, sumac etc. Buttermilk, correctly the liquid left after yoghourt has been churned to make zibdeh/samn, but also referring to a yoghourt drink. Strained or thickened yoghourt, similar to a cream cheese. This is best eaten with a drizzle of olive oil and some fresh flat bread, khubz. It can be used with limitations as a substitute for cream and sour cream. The Omani name for mushalal, made from sheep's milk, hard and salty. An Egyptian cheese, originally a grey salty peasant cheese with a very strong flavour. Fresh cheese curds and prepared cheeses such as arrish/domyati were poured into an earthenware crock (ballas) with some milk, salt, flavourings and a starter from a previous batch of mish. This was left to mature for one year, pasteurised and packed for consumption or distribution. There was a wide range of flavourings, sesame seed cake, milk solids from samn preparation, fenugreek, chilli/paprika, anise, cumin, cloves, nutmeg, thyme, nigella, etc. to taste. It is usually encountered as a crumbled mass of curds in whey, generally pale red brown in colour but with some pure white curds. Red chilli pepper flakes betray the hot flavour which is also very salty. These seem to be prepared by the local dairies, imported mish misri from Egypt is also available and has a smoother more uniform consistency. The cheese has a strong spicey fragrance and is usually available in supermarkets in strong and milder forms depending on the chilli content. Small rock hard marbles of cheese and salt, an Iranian product seen in Dubai spice suq. Another string cheese originating in Syria, the long curds left unbroken and ingeniously twisted into small bundle, usually with nigella seeds incorporated, salty and best rinsed before eating, a good breakfast cheese. A white brined cheese, originally from Nablus in the West Bank, prepared from sheep or goat’s milk. The curds are pressed in small portions in cheese cloth and may be boiled in brine containing a mix of mastic gum and mahaleb to help preserve the cheese and improve its flavour and texture. Samples purchased in the UAE were of Syrian origin and were white flat small tablets of dried folded roughly rectangular curd with salt crystals on the surface. Eaten thus they were very salty and with a chalky texture and flavour. After soaking in water for 24 hours, the paste had expanded to a creamey texture. Still quite salty and with a chalky flavour. It melts when cooked. This cheese is particularly used for sweet dishes. The heavy salting is a long term preservative which is removed by repeated soakings. The name in the Northern Emirates for a drink prepared from laban and water, similar to sharab laban. Elsewhere in the UAE it is referred to as laban. An Egyptian cheddar style cheese (rumi means Roman or Western), often sold in pre-sliced packets. The paste is firm and pale orange in colour, it has a full mature flavour and crumbly texture. Usually contains black peppercorns scattered rather infrequently through the paste. Clarified butter, the fresh butter is heated with flour and herbs or spices to remove the curds and impart a flavour, in this form it will keep without refrigeration for long periods. It was an important article of commerce and is still produced on a small scale locally. Well strained sheep’s yoghourt is de-fatted or fresh cottage cheese is salted and rolled into balls and dried thoroughly. These are stored until the paste darkens and a surface mould has developed. This is scraped off, the ball is coated with melted butter and then rolled in za'atar, thyme. It has quite a firm consistency but crumbles under the knife. The paste is pale brick red with spots of small white curds and it has a piquant salty flavour, one almost suspects the inclusion of a little chilli. This cheese is from Syria and Lebanon and is served as a mezze by slicing the cheese and drizzling olive oil over it. Sold in jars under oil and also loose or in vacuum packs. A country version SHANKLEESH BALADI is also available and is very similar with a softer, more mixed paste with more chili flakes and inclusions of za’atar coating. The word means drink and is applied to the buttermilk left after the churning to make zibda. Yoghourt diluted with water and slightly salted to make a drink, ground fenugreek seed is used to flavour a version recently introduced into the local market, see also raab. Fresh white cheese from Egypt with a soft creamy paste, moderately salted and with a well developed slightly acid taste. ---, unpublished interviews with Saudi Arabian nationals, Gulf News, product labels and ephemera. The 1976 statistics represent a pre-oil development picture of dairy use. Total milk production from all sources was 15,300 tonnes of which 3,500 tonnes was recorded as being processed in some way. The balance presumably was either drunk as fresh milk by humans or stock. By 1992, only milk production on commercial dairy farms was being registered with no records available for milk production other than cow’s. There had been a fifteenfold increase in productivity per head. The history of dairy produce in the United Arab Emirates is reviewed from the prehistoric period to the present day using archaeological research and published accounts of the history and culture of the region. The different animals used as sources of milk and the traditional methods of consuming and processing dairy products are discussed. The role of imports and the culinary uses of dairy produce are briefly detailed. The substitutes and modern replacements for traditional dairy produce are also examined. Government statistics on dairy produce clearly show that a significant change has taken place in the local dairy production and consumption patterns over the last three decades as the country has developed. Private dairy farming and consumption of home produce has declined. A dairy industry with modern marketing methods has been created to satisfy a tenfold increase in population. As a result traditional products are in decline. A glossary of traditional Arabian dairy products is attached together with a table of basic nutritional information on a selection of these products. The method is mentioned in Pliny, Dioscorides and others. Vimto is a fruit cordial drink, originally from the north of England, now locally packaged in Saudi Arabia. I have never met anyone who has admitted to drinking this product and although it is on the local supermarket shelves, I still wonder where all the empty Vimto bottles come from. In Al-Ansari’s book, 48% of the recipes have a dairy product and in a further 27%oil as a cooking medium is used. Comparative figures for Saudi cuisine are similar. The following article appeared in the Summer 1994 issue of the Newsletter. It was with some trepidation that I decided to arrange a trip to see bats, as animals are notorious for disappointing would-be watchers. Fortunately we were a the spot in good time and the bats cooperated and left the roost 20 to 30 minutes after sunset as I had expected. I first found this place one summer night when, tired of being restricted to the house by the daytime heat, I went out for a moonlight walk and climb. I scrambled up one of the limestone ridges on the outskirts of Buraimi and traversed the crest. Descending the side of the ridge, I stopped on a level sandy patch at the foot of a small cliff for a short rest. As I stood there, I became aware of whooshing sounds about me. I waited for some time, fascinated by the creatures that were flying around me, but unable to make them out in the moonlight. A visit to the same spot in daylight confirmed what I suspected. In the overhanging cliff were two vertical fissures. Beneath them were two strips of bat dung. Despite the heat and it being full daylight, I glimpsed dark shapes scrabbling further back into the fissure, squeaking to each other as theydid so. Bats are difficult to identify in flight, and I was advised that my best chance of determining the species was to find a dead one. I watched the roost over a period of time, but no bats ever collapsed of heart failure on take-off. However, in the mean time, I had the opportunity to watch some Muscat Mouse-tailed bats and realized that the mystery bats were larger and more powerful fliers. After a good view of ony by torch light, I referred to Harrison (1981) again and decided that they must be Naked-bellied Tomb Bats. On my next visit I spotted a skull that must have been lying there for years, part-buried in the sand. Comparing this with photos in Harrison and Bates (1991) showed clearly that it was a Naked-bellied Tomb Bat (Taphozous nudiventris) . Incidentally, the other species of Taphozous is simply known as the Tomb Bat and not "Hairy-bellied Tomb Bat." Bats are among the most numerous mammals in this region. By way of illustration, in the last two years, I have seen three gazelles, a few hedgehogs and gerboas, and perhaps a dozen hares and foxes. By contrast, one may see 20 bats roosting under one falaj man-hole cover and hundreds flying on a single night. I trust that in an educated group like this, there is no superstitous dread of bats. Bats are, in fact, beneficial creatures, with a high metalolic rate that gives them a prodigious appetite for insects. They are valuable economically for their role in insect control. Bats are notoriously difficult for the amateur naturalist to study. It is generally impossible to tell which species i schasing moths around a street light. Up to 10 species could occur in this region. Casual observation shows that their numbers vary drmatically through the year. The Al Ain ENHG is starting a project to gather informatin on bats, including annual variation in numbers. Even if you don't know a gazelle from a gecko, you can make a valuable contribution, provided, of course, that you are not blind as a bat. We would like all members travelling to or from Dubai at night to count the bats that can be seen hunting moths around the lights on the lit section of the road, that is from Al Faqah (where the road changes from two to three lanes) to the Hilli roundabout by the ice arena. I anticipate that numbers will range from zero, as at present, to a few hundred in the summer. To make this a success we will need as many members as possible to participate. Since the number of bats will vary not only with the time of year but also with the daily weather conditions and possibly with the phases of the moon, the more counts the better. The project will need to run for about two years to give valid results. Please note the following points. 1) Safety first! It is better for counting to be done by passengers, not drivers. Anyway, don't risk an accident. 2) Don't worry if you think that you have missed a few bats or missed count. Just give you best estimate. Obviously large numbers will only be approximate but this does not diminish their value. 3) A zero count is just as important as a count of 200. Provided this project gets the support from members necessary for its success, the results will have two uses. First, it will give basic information to be used by future professsional researchers, both to plan their work and interpret their results. Second, counting could be repeated in 10 or 20 years time to see if environmental changes have affected bat numbers.